As a young child, all you ever wanted was to be one year older. But at a certain age, the roles reverse, and you find yourself wishing you could be young again without a care in the world. No projects, no work, no bills, no…need I go on? The difference between our problems as children and our problems as adults is not only magnitude, but the fact we can’t necessarily go running to mom or dad for comfort or answers. (Notice that I said necessarily). That’s not to say, we still can’t indulge in our parent’s sympathy at times. Jokes aside, think back to the things your mom and dad made you do to calm down, or–better yet– to get your mind off of things. Enter, the adult coloring book. Yes, you read that correctly. Adult coloring books are officially trending and are being dubbed the “new,” cool way to decompress during a hard workday. 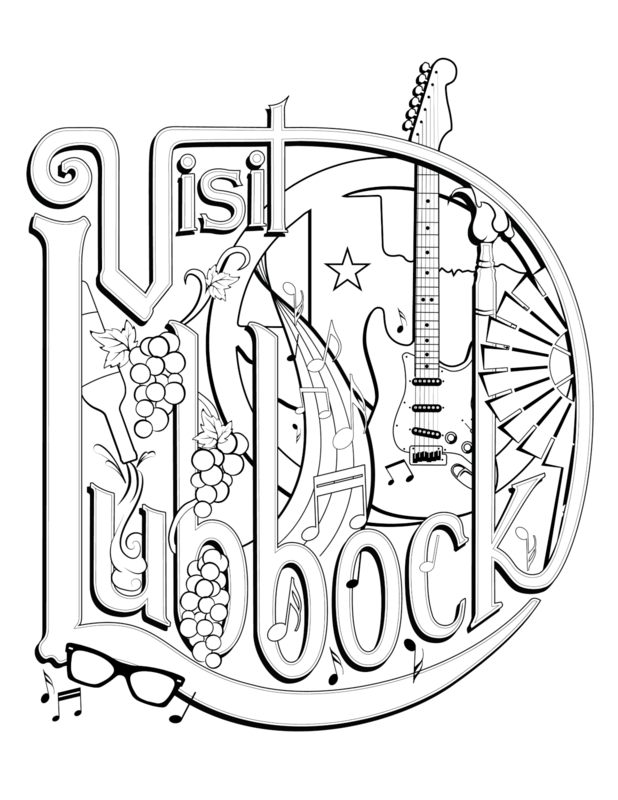 With that being said, we created our very own Lubbock-themed coloring sheet, which you can download here. Did you know 80 percent of Texas wine grapes are grown right here on the South Plains? Color it red, white or even blush. Whichever you choose, once your finished with the sheet, you can color your weekend at one of our five award-winning wineries. Since you’re indulging in your creative side already, plan to check out the First Friday Art Trail, hosted the first Friday of every month, or take a stroll on campus to see the Texas Tech Public Art collection. In fact, this art hub was one of the first Cultural Districts recognized by the State of Texas. With more than 2,300 events each year, Lubbock is the perfect place to feed your creative spirit. Home to Buddy Holly and an endless list of other musical legends, if you want music, Lubbock is your answer. Whether you’re looking for a Texas country music festival or the sophisticated sounds of the Opera, you’ll find the distinct music of West Texas every week. Explore the city named the No. 1 Western Town in the U.S. by True West Magazine. From the sites and sounds of the old west at the National Ranching Heritage Center to the awe-inspiring wonders of the world’s largest windmill museum, the rich history of Lubbock is around every corner. And while you’re out and about, be sure to snap a photo and share with #LiveLoveLubbock! You could see it featured on our social media channels. Happy exploring!